What Should I Know About Pesos? It’s always advisable to bring money in a variety of forms on a vacation: a mix of cash, credit cards, and traveler’s checks. You should also exchange enough petty cash to cover airport incidentals, tipping, and transportation to your hotel before you leave home, or withdraw money upon arrival at an airport ATM. The currency in Mexico is the peso. Paper currency comes in denominations of 20, 50, 100, 200, and 500 pesos. Coins come in denominations of 1, 2, 5, 10, and 20 pesos, and 20 and 50centavos (100 centavos = 1 peso). The current exchange rate for the U.S. dollar, and the one used in this book, is around 13 pesos; at that rate, an item that costs 13 pesos would be equivalent to US$1. Getting change is a problem. Small-denomination bills and coins are hard to come by, so start collecting them early in your trip. Shopkeepers and taxi drivers everywhere always seem to be out of change and small bills; that’s doubly true in markets. Many establishments that deal with tourists, especially in coastal resort areas, quote prices in dollars. To avoid confusion, they use the abbreviations “Dlls.” for dollars and “M.N.” (moneda nacional, or national currency) for pesos. Don’t forget to have enough pesos to carry you over a weekend or Mexican holiday, when banks are closed. In general, avoid carrying the U.S. $100 bill, the bill most commonly counterfeited in Mexico and therefore the most difficult to exchange, especially in smaller towns. Because small bills and coins in pesos are hard to come by in Mexico, the $1 bill is very useful for tipping. A tip of U.S. coins, which cannot be exchanged into Mexican currency, is of no value to the service provider. The bottom line on exchanging money: Ask first, and shop around. Banks generally pay the top rates. Casas de cambio (exchange houses) are generally more convenient than banks because they have more locations and longer hours; the rate of exchange may be the same as at a bank or slightly lower. Before leaving a bank or exchange-house window, count your change in front of the teller before the next client steps up. Large airports have currency-exchange counters that often stay open whenever flights are operating. Though convenient, they generally do not offer the most favorable rates. A hotel’s exchange desk commonly pays less favorable rates than banks; however, when the currency is in a state of flux, higher-priced hotels are known to pay higher rates than banks, in an effort to attract dollars. Note: In almost all cases, you receive a better rate by changing money first, then paying. You’ll avoid lines at airport ATMs (automated teller machines) by exchanging at least some money — just enough to cover airport incidentals and transportation to your hotel — before you leave home (though don’t expect the exchange rate to be ideal). You can exchange money at your local American Express or Thomas Cook office or at your bank. American Express also dispenses traveler’s checks and foreign currency via www.americanexpress.com or tel.800/673-3782, but they’ll charge a $15 order fee and additional shipping and handling costs. A Few Words about Prices — The peso’s value continues to fluctuate — at press time, it was roughly 13 pesos to the dollar. Prices in this guide (which are always given in U.S. dollars) have been converted to U.S. dollars at 11 pesos to the dollar. Most hotels in Mexico — with the exception of places that receive little foreign tourism — quote prices in U.S. dollars. Thus, currency fluctuations are unlikely to affect the prices most hotels charge. Mexico has a value-added tax of 15% (Impuesto de Valor Agregado, or IVA; pronounced “ee-bah”) on most everything, including restaurant meals, bus tickets, and souvenirs. (Exceptions are Canc?n, Cozumel, and Los Cabos, where the IVA is 10%; as ports of entry, they receive a break on taxes.) Hotels charge the usual 15% IVA, plus a locally administered bed tax of 2% (in most areas), for a total of 17%. 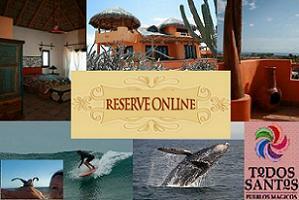 In Canc?n, Los Cabos, and Cozumel, hotels charge the 10% IVA plus 2% room tax. The prices quoted by hotels and restaurants do not necessarily include IVA. You may find that upper-end properties (three or more stars) quote prices without IVA included, while lower-priced hotels include IVA. Always ask to see a printed price sheet and always ask if the tax is included. Banks in Mexico are rapidly expanding and improving services. They tend to be open weekdays from 9am until 5pm, and often for at least a half day on Saturday. In larger resorts and cities, they can generally accommodate the exchange of dollars (which used to stop at noon) anytime during business hours. Some, but not all, banks charge a service fee of about 1% to exchange traveler’s checks. However, you can pay for most purchases directly with traveler’s checks at the establishment’s stated exchange rate. Don’t even bother with personal checks drawn on a U.S. bank — the bank will wait for your check to clear, which can take weeks, before giving you your money. Travelers to Mexico can easily withdraw money from ATMs in most major cities and resort areas. The U.S. Department of State has an advisory against using ATMs in Mexico for safety reasons, stating that they should only be used during business hours, but this pertains primarily to Mexico City, where crime remains a significant problem. In most resorts in Mexico, the use of ATMs is perfectly safe — just use the same precautions you would at any ATM. Universal bank cards (such as the Cirrus and PLUS systems) can be used. This is a convenient way to withdraw money and avoid carrying too much with you at any time. The exchange rate is generally more favorable than that at casas de cambio. Most machines offer Spanish/English menus and dispense pesos, but some offer the option of withdrawing dollars. The Cirrus (tel. 800/424-7787; www.mastercard.com) and PLUS (tel. 800/843-7587;www.visa.com) networks span the globe. Go to your bank card’s website to find ATM locations at your destination. Be sure you know your daily withdrawal limit before you depart. Note: Many banks impose a fee every time you use a card at another bank’s ATM, and that fee can be higher for international transactions (up to $5 or more) than for domestic ones (where they’re rarely more than $2). In addition, the bank from which you withdraw cash may charge its own fee. For international withdrawal fees, ask your bank. Credit cards are another safe way to carry money. They also provide a convenient record of all your expenses, and they generally offer relatively good exchange rates. You can withdraw cash advances from your credit cards at banks or ATMs, but high fees make credit-card cash advances a pricey way to get cash. Keep in mind that you’ll pay interest from the moment of your withdrawal, even if you pay your monthly bills on time. Also, note that many banks now assess a 1% to 3% “transaction fee” on all charges you incur abroad (whether you’re using the local currency or your native currency). In Mexico, Visa, MasterCard, and American Express are the most accepted cards. You’ll be able to charge most hotel, restaurant, and store purchases, as well as almost all airline tickets, on your credit card. Pemex gas stations have begun to accept credit card purchases for gasoline, though this option may not be available everywhere — check before you pump. You can get cash advances of several hundred dollars on your card, but there may be a wait of 20 minutes to 2 hours. Charges will be made in pesos, then converted into dollars by the bank issuing the credit card. Generally you receive the favorable bank rate when paying by credit card. However, be aware that some establishments in Mexico add a 5% to 7% surcharge when you pay with a credit card. This is especially true when using American Express. Many times, advertised discounts will not apply if you pay with a credit card. You can buy traveler’s checks at most banks. They are offered in denominations of $20, $50, $100, $500, and sometimes $1,000. Generally, you’ll pay a service charge ranging from 1% to 4%. The most popular traveler’s checks are offered by American Express (tel. 800/807-6233 or tel.800/221-7282 for card holders — this number accepts collect calls, offers service in several foreign languages, and exempts AmEx gold and platinum cardholders from the 1% fee) andVisa (tel. 800/732-1322) — AAA members can obtain Visa checks for a $9.95 fee (for checks up to $1,500) at most AAA offices or by calling tel. 866/339-3378. Call tel. 800/223-9920 for information on MasterCard traveler’s checks. Be sure to keep a record of the traveler’s checks serial numbers separate from your checks in the event that they are stolen or lost. You’ll get a refund faster if you know the numbers. American Express, Thomas Cook, Visa, and MasterCard offer foreign currency traveler’s checks, useful if you’re traveling to one country or to the Euro zone; they’re accepted at locations where dollar checks may not be. Another option is the new prepaid traveler’s check cards, reloadable cards that work much like debit cards but aren’t linked to your checking account. The American Express Travelers Cheque Card, for example, requires a minimum deposit, sets a maximum balance, and has a one-time issuance fee of $14.95. You can withdraw money from an ATM (for a fee of $2.50 per transaction, not including bank fees), and the funds can be purchased in dollars, euros, or pounds. If you lose the card, your available funds will be refunded within 24 hours.